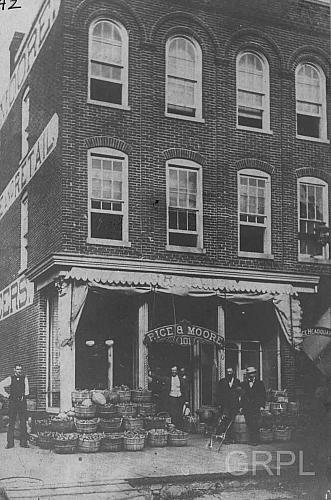 From 1871-1882 The police department had two rooms--one for an office and another for a lock-up--on the second floor over a grocery operated by Rice & Moore at the corner of Monroe and Ionia. In June of 1882 they moved to larger facilities at the southeast corner of Lyon and Campau. 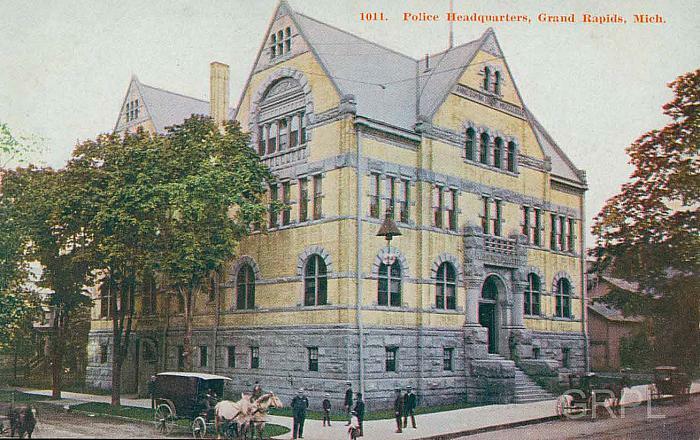 The new four-storied police headquarters, built in 1892 on Crescent at Ottawa NW, was designed by Elijah E. Myers of Detroit, also the architect of the Grand Rapids City Hall. Two cells, turnkey's rooms, and a boiler were located in the basement. There was also a wagon room connected to the barn which had stalls for eight horses. An addition which enlarged headquarters by a third was added to the police department in 1914, and the steps of the front entrance on Crescent were replaced by a double staircase. The traffic division was moved into a section of the brewery building on Ottawa Ave. that the city had acquired. 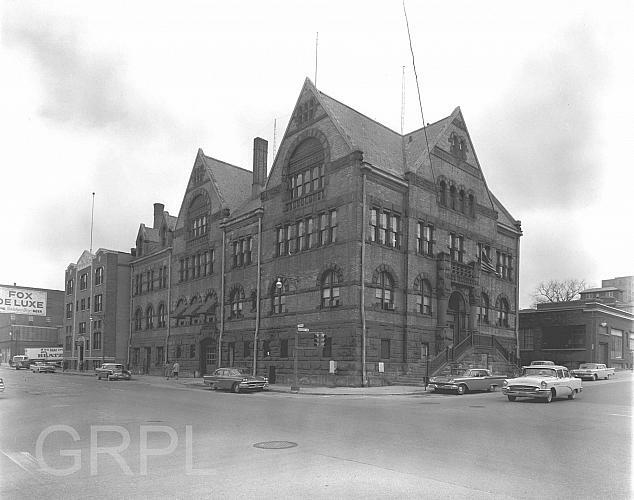 The building was occupied until the mid-1960s when it was demolished and the department moved to new headquarters on Monroe at the corner of Michigan. 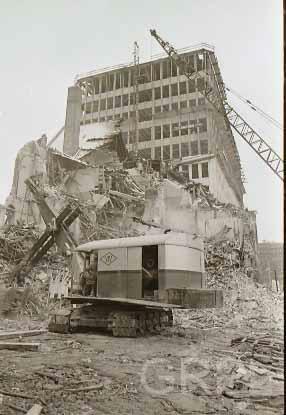 During the demolition of police headquarters not only the was the building destroyed but many of the old police records were thrown into dumpsters. Consequently, a rare arrest book, from the 1920s is one of only two survivors rescued from a dumpster by a concerned citizen; it now resides in the city archives. 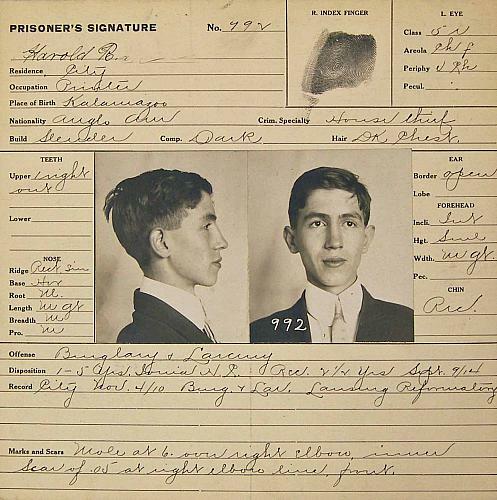 The second arrest book includes years from 1897 - 1913 and is housed in the Public Museum archives. The old arrest or "mug" books were about sixteen inches square, eleven inches deep, and held together by long iron bolts. Each page contained records for three individuals and included their personal information and description, reason for arrest, full-front and profile photos, any prior record, arresting officer, and the sentence or fine imposed. 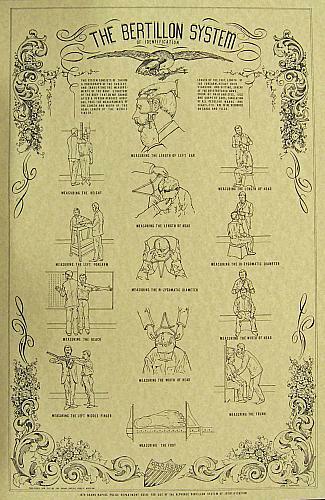 Alphonse Bertillon, a French policeman, created an identification system in 1897 based on the measurement of various parts of the body. 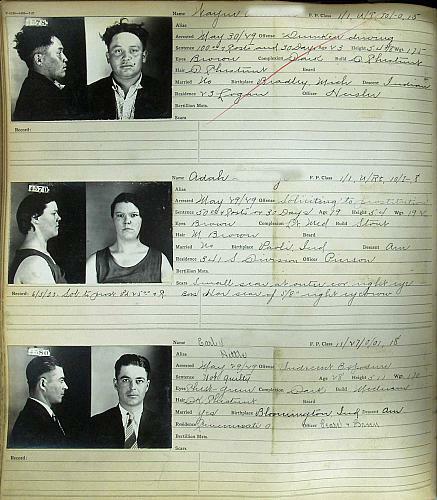 The Bertillon chart, used by police departments, illustrates how to take the various measurements that were used in the identification of criminals. The method was widely favored by law enforcement during the early part of the 1900s but was later discarded. 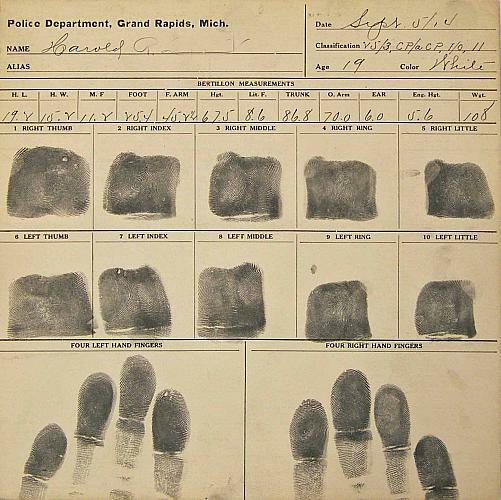 The Bertillon system of identification categorized types based on groups of measurements and were used in conjunction with fingerprint records. They included head length, head width, length of the foot and forearm, height, trunk, reach, ear and weight. These measurements were recorded on the fingerprint chart above the actual fingerprints. The classification code was recorded under the date. The reverse side of the fingerprint card included full-front and profile photographs, personal information, reasons for arrest, and any prior arrest record. Also recorded were descriptions of teeth, nose, ear, forehead, chin, left eye, and a print of the right index finger. The fifth and current location of the police department is on the west side of Division between Fulton St. and Monroe Ave., the site of the former Herpolshimer Department Store. Glance at the Past makes the case for the creation of the GRPD. Baxter, Albert. 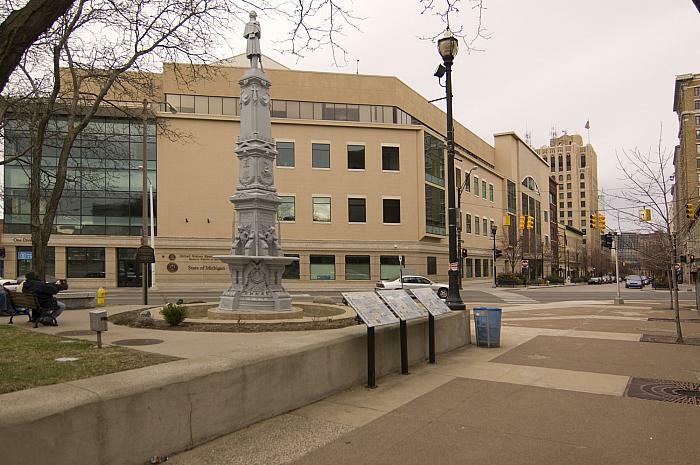 History of the City of Grand Rapids, Michigan. New York, Grand Rapids: Munsell & company, 1891. Goss, Dwight. History of Grand Rapids and Its Industries. Chicago: C. F. Cooper, 1906. Lydens, Z. Z. The Story of Grand Rapids. Grand Rapids: Kregel Publications, 1966.